Featured! ADK Handmade Pens Home | About Us | Opportunities | Sponsorships | Contact Us! Today’s ‘Featured!’ guests is one of those people who helps us understand why having a craft and a passion is so important – and you just may have your perspective on a few things changed as part of the process! We had the pleasure and privilege of interviewing Adolph Kurth who creates one-of-a-kind handmade pens. He was born and trained in Cologne, Germany, and moved to Rochester, N.Y. where his studio is today. 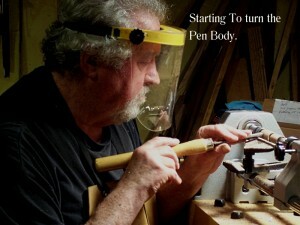 I operate a one man full-service pen making shop in Rochester, N.Y. on the shores of Lake Ontario. 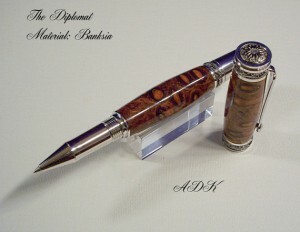 Here I make truly one-of-a-kind, single edition pens of all types from ballpoint to fountain pens. Most are made with specially selected rare woods to produce absolutely unique Instruments. In addition, Hand-cast acrylic pens reminiscent of the glamour days of Hollywood are also available. I always encourage my clients to feel free to choose from over 100 wood species and numerous acrylic patterns. I love making a custom pen! Since I have lived most of my professional life in the Middle East, North Africa, and Europe, it is not surprising that my pens are shipped worldwide. I have made pens for over 45 years now and decided that the only way I could make the writing instruments I really wanted to make was to open my own shop. We’re very happy that ADK Pen Studio opened up and that you are sharing your work and your tradition with all of us – it’s absolutely stunning! >>> What goes in to creating the handmade and one-of-a-kind pens you make? In this day of keyboards and throw-away pens, I decided that there was still a place for top quality writing Instruments, especially since the well-known quality pen making companies no longer supported the American market and that their Pens had become prohibitively expensive – you have to ship your $1000.00 Pen to Europe to get it fixed! All of my Pens are made by my own hands in my shop. My shop is well equipped with tried and proven hand tools, most of them custom made for working with tiny details in wood and metal parts which are so common in pens. There is not a single automatic anything in my shop. Most Pens are made by selecting a beautiful piece of wood which looks a lot like firewood at this stage. A set of furnishings (Hardware) is then chosen which complements the wood. The wood is then turned on a lathe to very exacting specifications and contours to match the hardware and your writing hand. A very elaborate finishing and polishing regimen completes the Pen. No dyes or coloring agents are used on my pens. Clear hand polished lacquers simply highlight the grain and color of the wood. As far as I am concerned, pen making is a craft. If there is an art in pen making, it is in being able to spot fascinating colors and grain structures in something that looks like firewood and shaping it in a way that reveals the beauty within. 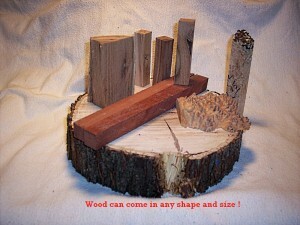 I have well over 100 different wood species in my inventory. They include some of the most precious and rare woods to be found anywhere. Most of them are gathered by friends and acquaintances all over the world. They pay farmers and locals a small fee for gathering wood pieces left in the forest after trees are felled for another purpose. Many of the trees are too small to be commercially harvested or are too remote to make shipping them to market worthwhile, thus I can obtain some of the most precious woods for my pens without impacting the environment. As an interesting side note, exotic or precious woods don’t have to come from faraway places! Some of the most extraordinary timber is grown in tiny regions right here in the USA. 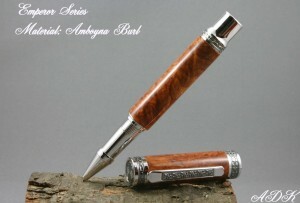 It is the timber that is my inspiration for making a given pen. When I find a promising piece of wood, I then search for the Furnishings (hardware) that would make a great marriage. Only top quality furnishings with heavy, specially formulated precious metal platings are used for my pens. All you have to do is pick one up, the heft is immediately apparent. The nice thing about all this is the fact that a client can order any pen style made with any wood he chooses. There is never any extra charge for made to order work. Now, If I could just get clients to ask for what they want! That’s amazing! 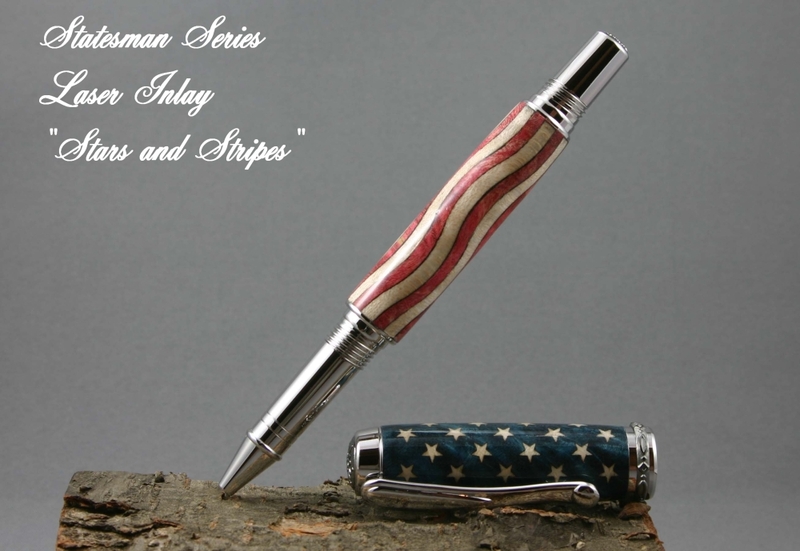 Having a custom made pen seems like it would be a very special, heirloom quality gift for someone or for one’s self. >>> In the modern day, it seems that many people use electronic devices instead of pen and paper. Why do you think it’s import for people to connect with the process of writing by hand? Aside from the fact that good handwriting is one of the social graces, like learning how to use a knife and fork properly at a dinner table, the handwritten note or letter shows that the correspondence is important to the writer. It adds an intimate touch which a keyboard cannot convey. Besides, a well made writing Instrument is just a pleasure to use. In addition, it encourages the flow of ideas since writing is a very tactile activity. I have a number of clients which are professional writers and authors, and while they submit their manuscripts in typed or printed form; their original ideas are always hand written! It is unfortunate that really good writing instruments have become prohibitively expensive. Take a look at some of the top quality pens on the market these days – talk about price shock! This is where the small pen making shop can really shine and do it at a price that most people can afford. There is nothing else that can convey a personal message in the way that the handwritten word can. We’re very lucky and very grateful that you are offering your work at such affordable prices, and that you are reminding us of the power, romance, and value of the hand written word! 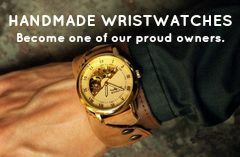 >>> Everything that comes out of your shop is handmade. Why do you think handmade is more important or more valuable than mass-produced items? Let’s debunk a myth here.! Just because an item is hand made does not mean it is more valuable than a manufactured product. There is an awful lot of shoddy handmade stuff out there! The craftsman’s skill, the techniques he acquired over time, and quality workmanship is what makes handmade things more valuable. If the artisan also brings a sense of style and innovation to the party, the value increases even more. How do you put a price on an idea? If I encounter a piece of timber with an anomaly, I can choose to include that anomaly and make it a feature of the pen, which will make it totally unique. A machine does not have that freedom of choice, nor the skill to implement it. Of course an element of the maker’s personality will always come through, but that is of no value if the product is poorly made. Regardless of what a craftsman makes, the item has to be fully functional and attractive to be of any use. Even a picture is useless if it is made in a way that does not allow you to view it. Beautifully stated – and a definite truth that we would all benefit from remembering! >>> What piece of wisdom would you like to share with our readers before we end? Something to inspire us! If I have learned one thing over the years, it is that a true craftsman makes things for himself. Because in the end he will not make anything that he finds unattractive or ugly. As long as you work with your head and hands, you will always be a craftsman. When you start working with your soul, you might just become an artist! >>> Thank you so much for your time, your work, and your wisdom! How can we connect with you and your shop? Join us next week for another Featured! interview, and don’t forget to sign up for our Handmade Men mailing list to receive giveaway info, men’s gift guides, and more right to your inbox! Look for the ‘Join Now’ button on the right sidebar. 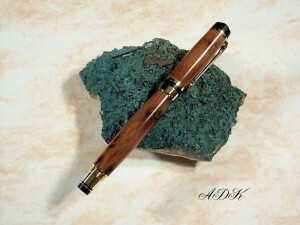 Tagged ADK, ADK Pen Studio, featured!, Handmade Pens, Pens. Bookmark the permalink. Beautiful work from a skilled and talented craftsman! Heading over to Etsy now to check out all of your gems.